Published: April 18, 2013 at 07:53 p.m. Updated: April 18, 2013 at 11:15 p.m. 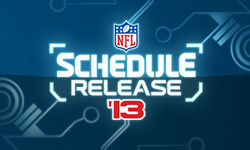 The 2013 NFL schedule release is all about the order, not the opponents. We already knew the 16 opponents for all 32 NFL teams heading into Thursday. The schedule is based on a predetermined formula that doesn't allow for favoritism, a fact I've come to realize many fans and even media members don't understand. The divisions rotate playing one division in conference and another out of conference. (The teams in the NFC North, for instance, face the NFC East and AFC North this season.) That's eight games. Then you have six division games. That's 14 games decided. The NFL tries to help out the lesser teams with the remaining two games. First-place teams play two conference games against the other first-place team from the year before. Last-place teams get two games against fellow bottom-dwellers in conference, and so on. Those two games are the only difference between a schedule for a team like the San Francisco 49ers and a last-place squad like the Arizona Cardinals. Two games. That's it. It will be an uphill battle for the Dolphins to maintain their offseason excitement. They open with two straight road games, and three of four before returning home for a date with the Baltimore Ravens. It will be tough for the Dolphins to hit their Week 6 bye with a winning record. Four of the Jaguars' first six games are on the road, including mission-impossible trips to Denver and Seattle. It's going to be tough for new coach Gus Bradley to find wins early in the season with his young team. The Titans drew the short straw with the rare, dreaded three-game road trip. From Weeks 12-14, they head to Oakland, Indianapolis and Denver. That could be a season-killer. Chip Kelly's squad is the only other team with a three-game road trip. They head to Denver, New York (Giants) and Tampa Bay from Weeks 4-6. At least the schedule-makers gave the Eagles a Thursday night game before the road swing, so the Eagles get some extra rest beforehand. All that running in practice should come in handy. You can make a strong case that the NFC North is the best division top to bottom. It had three 10-win teams last season and a very talented last-place squad in the Detroit Lions. Its out-of-division schedule this season is similarly difficult. The teams in the division face the NFC East and AFC North. The Green Bay Packers have to add the Atlanta Falcons and San Francisco 49ers to this already tough slate. There just aren't any soft spots. This isn't about the Chiefs' schedule being particularly hard or unfair. But the Fighting Andy Reids only received one primetime appearance, and it was against Reid's old team. Alex Smith gets no respect! For comparison's sake, relatively generic teams like the Chargers and Dolphins got three primetime outings. The Eagles and Jets were cut down to size after poor years; both teams are only in primetime twice.